About 53 billion yuan (US$7.9 billion) was provided by government funds, which accounted for 46.1 percent of the total amount. Graduating doctorate and master's students toss their academic caps into the sky as they pose for photos at Nanjing Agricultural University in Nanjing, east China's Jiangsu Province, June 21, 2018.
total of 43.9 million college students in China received financial support in 2018, according to China Education Daily Monday. The rest mainly consisted of student loans provided by banks and higher educational institutions, while donations from individuals, social organizations or enterprises accounted for nearly 1.4 percent. The support came in three forms: scholarships, financial aid and student loans. 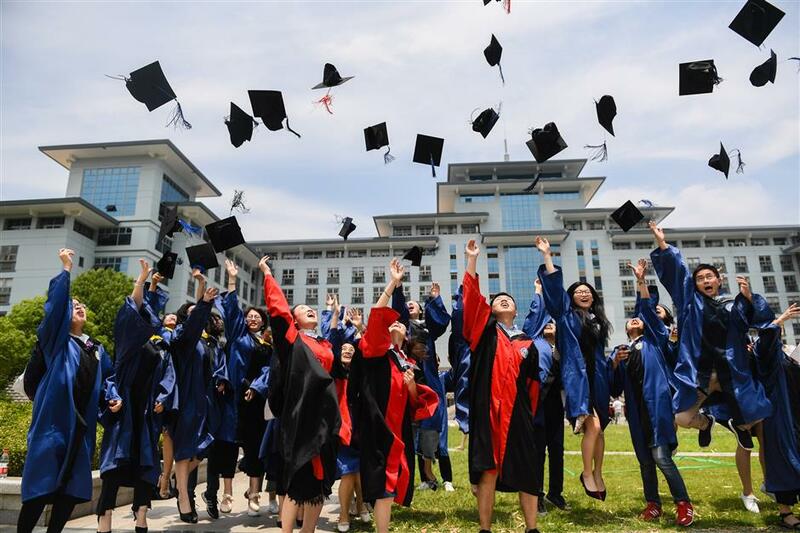 About 9.2 million students were awarded a total of 25 billion yuan worth of scholarships in 2018, which took up 21.8 percent of all the subsidies. Financial aid worth 32.8 billion yuan and student loans worth 32.6 billion went to 9.7 million students and 4.5 million students, respectively.